﻿ Q314: How do I setup my Stripe account to accept payments? FAQ Q314: How do I setup my Stripe account to accept payments? 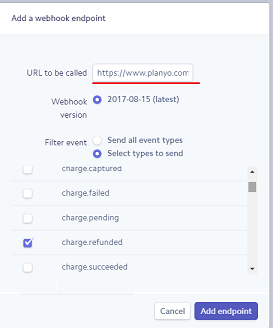 Optionally, you can also set up Stripe webhook so we can receive refunds initiated in your Stripe account. In this case, you will need to create a webhook endpoint that will point to a script in our system. In the Filter event section, choose Select types to send and select the charge.refunded event.